A few weeks ago, I ran across a box full of photos I had taken a while back. Actually, they were color slides, which should give you some idea of how old they are. Many of them were of people, events and even documents (photos of documents? Don’t even ask, I can’t remember why) from my second startup (actually, my third, but it was the second one I founded). 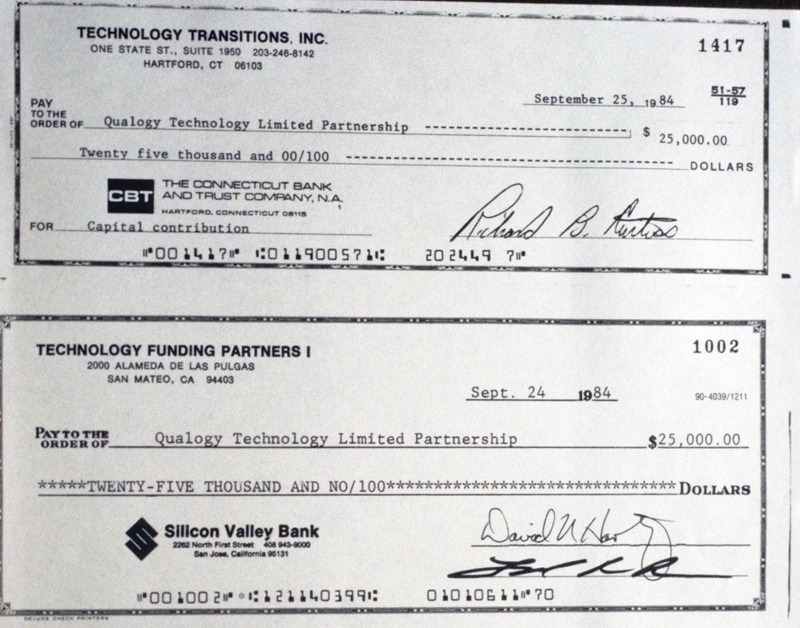 The company was originally named Qualogy Technology, but wiser minds prevailed and it was later changed to Viewlogic Systems. After a full year of effort, we finally beat someone into submission found an investor who believed in us and our plan. What did that initial deal entail? 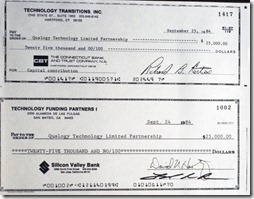 A total investment of only $50K (see the checks above – $25K from two VCs). My friend Dave points out that it amounts to a little over $100K in today’s dollars – not much money. In retrospect, the term sheet was crappy – contingencies, ratchets, board control issues and so forth. But none of that really mattered, we were on our way. If we had to make some additional sacrifices to be successful, they were acceptable. It was all about having the opportunity to execute our dream. Like you said at your Techstars talk last summer, when you don't have any money, decisions are easy. Thanks for the encouragement! Last week I met a guy who was totally stuck on getting funding for his company. We talked about burn rates, self funding options and I finally realized he didn't actually need any money.. they were set but his efforts to get more money were actually preventing him from driving the product direction and his companies future. When I asked why he was looking for funding, he didn't have a clear response… I guess he just assumed that's what startups did! Me, I'll take shoestrings and bootstraps! Qualody huh.. sounds like a compressed version of Quad Design Technology. I don't think I've ever told you this but Viewlogic was one of the main reasons I got into software (vs hardware). I was in my third year of electrical engineering when I first used Viewdraw to enter my designs, everyone else was still using paper. I got way behind in the beginning because of the learning curve but flew past once we had to tweak our designs. I was hooked.. so if that was you who gave away copies to UMass Amherst, I owe you. It was something I always tried to get Larry to do with Quads tools but never could. Always easy when working with dedicated, focused people like you, Alex. Hey world, check out Boomerang http://www.baydin.com/, Baydin's cool tool to help you deal with inbox overload. Chris, I didn't know the story about how ViewDraw's availability influenced you like that. That's so cool. I'd like to take credit, but the university stuff was always Alain Hanover's gig. You experience should be a lesson to all startups, though. Just like when DEC took over the university world from CDC by giving every college PDP-11s. Seems like a solid strategy.